Joy Bear, AM is a solid state or mineral chemist. She has had a career for which I have great admiration. It shows in the qualifications list in her CV, which leaps from a couple of diplomas in 1950 to a senior doctorate in 1978. She did it by her achievements at the lab bench doing scientific research. Among her early projects, research on petrichor or "the smell of rain" gained international attention. But it was her discoveries of new zirconium compounds - basic research - that earned her reputation. 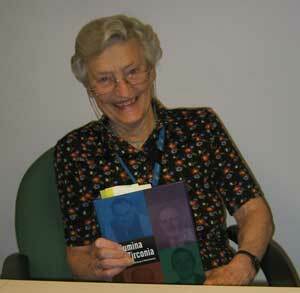 She was a ground-breaker for women, being the first woman promoted to a senior research post in her CSIRO division, in 1967, where she ran her own research program for many years. In 1988, she was the first woman to whom the Royal Australian Chemical Institute awarded their highest honour, the Leighton Lecture and Medal. She has engaged with scientific education as a senor adviser to government. She is still at her beloved CSIRO involved with research projects. Many thanks to Doug McCann for advice on Joy's chemistry. This interview © Copyright Joy Bear & Craig Robertson, 2007. In my study: notes on the past and memory; the role of the past; see In my study No.9 (3.6 Mb; 7' 53"). These notes were used for a forum The Past Matters presented by the Eltham Bookshop and Nillumbik Reconciliation Group, and held in the Eltham Courthouse in April, 2006. See also: Landscape & Memory by Simon Schama (Harper Collins Publishers, London, 1995. Alumina to Zirconia: The History of the CSIRO Divison of Mineral Chemistry I.J. Bear, T. Biegler and T.R. Scott, © CSIRO, 2001. I.J. Bear, Scientific Research: Foundation of our Future or Relic of our Past? Chemistry in Australia. Vol.56 (11), November - 1989, pp. 391-397 (transcript of the Leighton Lecture). I.J. Bear and R.G. Thomas, Genesis of Petrichor Geochimica et Cosmochimica Acta, Vol. 30, No. 9, pp.869-880, 1966. I.J. Bear and R.G. Thomas, Nature of Argillaceous Odour Nature (London), 1964, 201, 993-995. I.J. Bear and R.G. Thomas, Petrichor and Plant Growth Nature (London), 1965, 207, 1414-1416. The 1960s papers concern the research into the smell of rain. See also Magnus Pyke Butter Side Up! Chapter 9 (1976) for a popular science account of this work; Pyke also broadcast about it on the BBC. There are many papers concerning the zirconium compounds and other work in the Australian Journal of Chemistry and other chemistry journals. WiSeNet: do a site search on "bear".